The Gateway Center at the SUNY College of Environmental Science and Forestry (ESF) has achieved LEED Platinum certification, the highest level attainable under the Leadership in Energy and Environmental Design (LEED) rating system. "Earning LEED Platinum certification for the Gateway Center is a symbol of ESF's commitment to sustainability," said ESF President Quentin Wheeler. "Not only does this accomplishment move us toward our goal of carbon neutrality, it helps us educate our students about how to put their education to practical use and make a positive difference in the world." The LEED certification system was established by the U.S. Green Building Council and is the nation's pre-eminent program for the design, construction and operation of high-performance green buildings. 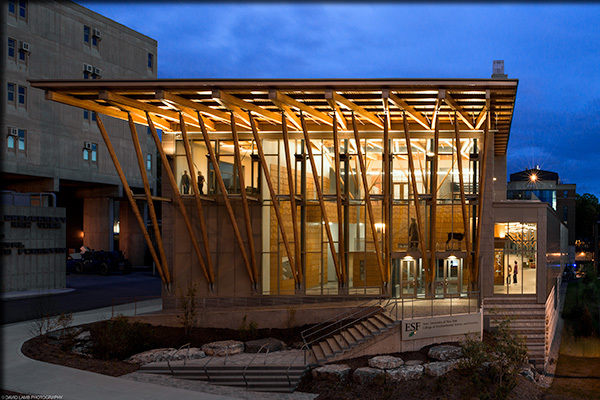 The Gateway Center, which formally opened in September 2013, is both a hub for campus activity and a teaching tool that demonstrates sustainability. The building features a combined heat-and-power system designed to provide the campus with 60 percent of its heating needs and 20 percent of its electrical power. It also features a green roof that uses native plant species from eastern Lake Ontario dunes and alvar pavement barrens at the northeastern end of Lake Ontario. The roof serves as both a research and demonstration project. The Gateway is a centerpiece of ESF's Climate Action Plan, which states ESF's commitment to achieving carbon neutrality by 2015. In addition, the Gateway Center, with its Trailhead Cafe, ESF College Bookstore, conference center and gathering areas, serves as a centerpiece for campus life. A portion of the college's renowned Roosevelt Wildlife Collection is also on display. "The Gateway Center also houses the Office of Undergraduate Admissions and Outreach, the two departments that have the most contact and interaction with the public so we can make a strong first impression on visitors to campus," Wheeler said. "They will see that this building represents who we are." Among the features that helped the Gateway Center achieve LEED Platinum certification are site selection, development density and community connectivity, public transportation access, water-efficient landscaping, optimized energy performance, onsite renewable energy, construction waste management, recycled content in materials and resources, indoor environmental quality, innovation in design and regional property credits that include stormwater design and heat island effect. The Gateway Center was designed by Architerra of Boston. In addition to earning the LEED Platinum certification last week, the building also received an honor from the Society for College University and Planning (SCUP). The society announced the Gateway Center received a 2014 SCUP/American Institute of Architects - Committee on Architecture for Education Excellence in Architecture for a New Building Honor Award.